Google Shopping Express teams up with Barnes & Noble: The Amazon-Hachette feud is good for someone. It’s important to note that this mass-market paperback copy of Along Came a Spider is not just a mass-market paperback copy of Along Came a Spider. It is also an emblem of the ongoing dispute between Amazon and publisher Hachette—and of the tremendous business opportunity that the feud has presented for other companies trying to break into the e-commerce and rapid-delivery space. Amazon, you might recall, is fighting an all-out war with Hachette. The “Everything Store” wants to get a 30 percent cut of sales and to sell most e-books for $9.99. In an attempt to squeeze compliance out of Hachette, Amazon is selling many of its titles at full price, eliminating preorders on upcoming Hachette books, and delaying shipments by several weeks. Authors—published by Hachette and otherwise—have responded to the sanctions with outrage and 909 of them signed a letter condemning Amazon’s negotiating tactics that will run as a full-page ad in the New York Times on Sunday. Retailers have had their own response to the dispute: They’ve lowered Hachette book prices. Walmart and Barnes & Noble slashed the cost of titles in June, and at Walmart, sales of physical books rose 70 percent in four days. Independent bookstores announced similar discounts and were rewarded with increases in sales and foot traffic. Google is the latest to jump on that bandwagon through its partnership with Barnes & Noble. 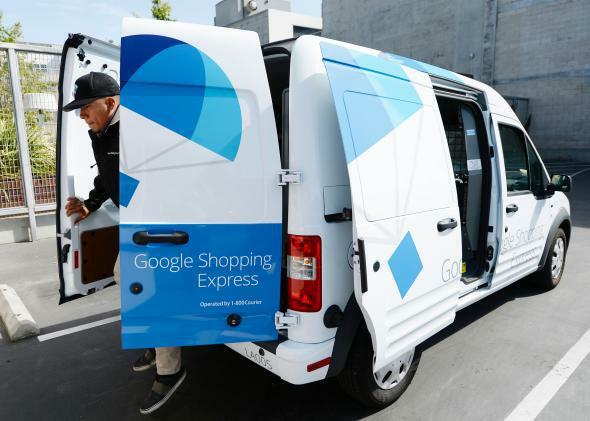 Google Shopping Express, the company’s same-day delivery service, launched in Manhattan in May and has already been working with big-box stores such as Costco, Walgreens, and Staples. By adding Barnes & Noble, it’s making a concrete push into the book-delivery business that Amazon has long dominated. And if Google can get Amazon customers to buy books on Shopping Express, maybe they’ll switch to its service for other items as well. Google Shopping Express has its flaws. When I tried to sign up yesterday, I got repeated error messages and had to consult customer service twice before it started to work. (“How frustrating—that’s very bizarre,” one online technician commented, after I explained that I couldn’t add an address to the “Deliver to” field.) On the other hand, once my account got hooked up, the process was totally smooth. I placed the order at 7 p.m. on Thursday for delivery between 9 a.m. and 1 p.m. on Friday, and Along Came a Spider came along to my office just an hour into that window. That’s fast service for anything—and for a Hachette title, it’s way faster than the one to three weeks Amazon is promising.